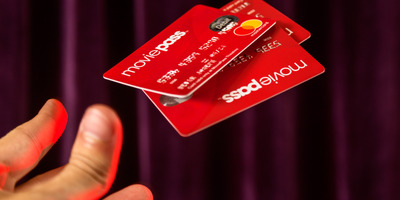 Many investors in the parent company of MoviePass, Helios and Matheson Analytics, have seen their stakes dwindle over 99% in recent months, with some losing over $US100,000. To fund massive MoviePass losses, Helios has flooded the market with new shares, diluting previous shareholders and sending the stock price plummeting. Helios is trading at about $US0.05. 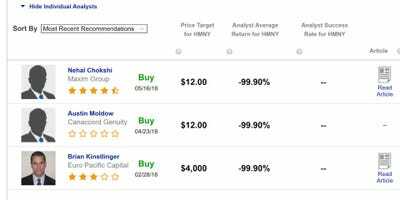 When Ken, a retiree investor, logged into E-Trade in March to research a stock called Helios and Matheson Analytics, it looked like a killer deal. “I use the analyst research to decide if I am going to buy a stock and after buying it, when to sell,” Ken told Business Insider, describing a feature on E-Trade that allows retail investors to see a summary of the ratings – buy, hold, or sell – that Wall Street analysts have given a company. Ken liked what he saw in Helios, the owner of the popular movie-theatre subscription service MoviePass, which makes up essentially the company’s entire business. Helios stock was trading under $US5, but at the time the two Wall Street analysts covering the stock recommended that investors buy, with price targets of $US15 and $US16. The stock didn’t reach $US16, or $US15. It kept dropping. Over the next few months, Helios racked up tens of millions in losses because of MoviePass, which changed its pricing structure in ways that made it likely to lose money on subscribers who used the service to see just one movie a month in theatres; many saw more than that. To raise money, Helios flooded the market with hundreds of millions of new shares, which helped send its stock into a downward spiral. But as Ken saw the share-price tank, the analysts kept their advice to “buy.” And he did. Ken bought in May, then in June, then in July – as the price dropped from $US4.62 to $US0.81 to $US0.25 to $US0.08. He stopped in late July, after Helios did a 1-to-250 reverse stock split that reduced his stake of 1 million shares to just 4,000 (but worth the same total amount). He had put almost $US190,000 into Helios. His stake is now worth about $US200. Ken’s story is not unusual. More than 74,000 Robinhood users hold the stock, the firm’s website shows. And that’s just one brokerage. E-Trade, which Ken used to buy shares, still allows its users to trade Helios stock. E-Trade did not respond to a request for comment. There is a personal story behind each retail investor who holds Helios, many of whom have seen the value of their stakes drop by over 99%. Helios did not respond to a request for comment. E-TradeAn E-Trade screenshot Ken provided showing the analyst recommendations. 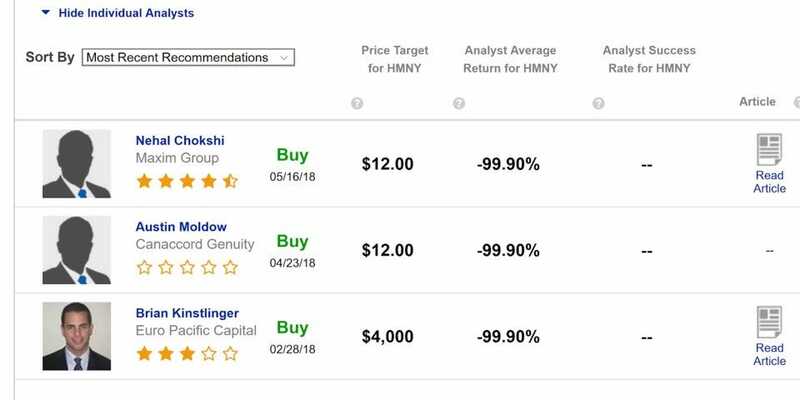 Last week, I wrote a piece about the two Wall Street firms – Canaccord Genuity and Maxim Group – whose analysts kept buy ratings on Helios until late July, as the firms made millions in fees helping sell the stock. After it published, I was contacted by many people who said they had lost big on Helios. Some, like Ken, said they were retirees or had lost a big chunk of their retirement savings. Other investors were younger, some of whom were a tad more optimistic about the loss. One sent a Robinhood screenshot of his stake being down 99.96%, almost $US12,000. Another screenshot showed an investor being down more than 10 times that, at nearly $US165,000 in the red. Still another investor said he’d encouraged friends to buy Helios based on the low price. “We all know now how that has worked out,” he said, adding he was personally down $US50,000 on the stock. So why did these investors decide to put their faith in, or gamble on, Helios? Several cited the analyst recommendations, which isn’t surprising given that it was the topic my previous piece focused on. One said she first found out about Helios through a Facebook group for investors and put $US8,500 into the stock in October. After that stake lost 99% of its value, she said, she went on E-Trade again in July to decide what to do. After the reverse split, the value of her second stake sunk as well. Other investors mentioned believing in MoviePass’ business model as a reason for their investment. One made the decision to buy recently, after getting an email from MoviePass limiting him, as a customer, to three movies a month instead of one a day. MoviePass pays full price for tickets subscribers buy, so heavy users of the service can cost the company a lot of money. Not all the investors were MoviePass users, however. Some heard about it from friends or found it through online sources like StockTwits, the social-media platform for retail investors. Though most of those who wrote to me were angry, there are still some investors who haven’t given up on Helios. And even after the torrent of negative press, some still see it as a potential buying opportunity. A prospective investor wrote to me this week saying he was considering putting money into Helios at $US0.05. “It’s a gamble but at this price, I’m a small investor in the market, and could afford to lose about $US500, equivalent to approximately 10,000 shares, hoping that they can dig themselves out of the hole within a year potentially making a profit,” he wrote.